Having prepared the ground, I’m now going to address in more detail how levels of competence can best be represented, and the implications for the rest of representing competence structures. Levels can be represented similar to other competence concept definitions, but need different relationships. I’ve written about how giving levels to competence reflects common usage, at least for competence concepts that are not entirely assessable, and that the labels commonly used for levels are not unique identifiers; about how defining levels of assessment fits into a competence structure; and lately about how defining levels is one approach to raising the assessability of competence concepts. Later: shortly after first writing this, I put together the ideas on levels more coherently in a paper and a presentation for the COME-HR conference, Brussels. Now, to take further this idea of raising assessability of concepts, it would be useful to define some new terms to do with assessability. It would be really good to know if anyone else has thought along this direction, and how their thoughts compare. First, may we define a binarily assessable concept, or “binary” for short, as a concept typically formulated as something that a person either has or does not have, and where there is substantial agreement between assessors over whether any particular person actually has or does not have it. My understanding is that the majority of concepts used in NOSs are intended to be of this type. Second, may we define a rankably assessable concept, or “rankable” for short, as a concept typically formulated as something a person may have to varying degrees, and where there is substantial agreement between assessors over whether two people have a similar amount of it, or who has more. IQ might be a rather old-fashioned and out-of-favour example of this. Speed and accuracy of performing given tasks would be another very common example (and widely used in TV shows), though that would be more applicable to simpler skills than occupational competence. Sports have many scales of this kind. On the occupational front, a rankable might be a concept where “better” means “more additional abilities added on”, while still remaining the same basic concept. Many complex tasks have a competence scale, where people start off knowing about it and being able to follow someone doing it, then perform the tasks in safe environments under supervision, working towards independent ability and mastery. In effect, what is happening here is that additional abilities are being added to the core of necessary understanding. Last, may we define a unorderly assessable concept, or “unordered” for short, as any concept that is not binary or rankable, but still assessable. For it to remain assessable despite possible disagreement about who is better, there at least has to be substantial agreement between assessors about the evidence which would be relevant to an assessment of the ability of a person in this area. In these cases, assessors would tend to agree about each others’ judgements, though they might not come up with the same points. Multi-faceted abilities would be good examples: take management competence. I don’t think there is just one single accepted scale of managerial ability, as different managers are better or worse at different aspects of management. Communication skills (with no detailed definition of what is meant) might be another good example. Any vague competence-related concept that is reasonably meaningful and coherent might fall into this category. But it would probably not include concepts such as “nice person” where people would disagree even about what evidence would count in its support. If you allow these new terms, definitions of level relationships can be more clearly expressed. The clearest and most obvious scenario is that levels can be defined as binaries related to rankables. Using an example from my previous post, success as a pop songwriter based on song sales/downloads is rankable, and we could define levels of success in that in terms of particular sales, hits in the top ten, etc. You could name the levels as you liked — for instance, “beginner songwriter”, “one hit songwriter”, “established songwriter”, “successful songwriter”, “top flight songwriter”. You would write the criteria for each level, and those criteria would be binary, allowing you to judge clearly which category would be attributed to a given songwriter. Of course, to recall, the inner logic of levels is that higher levels encompass lower levels. We could give the number 1 to beginner, up to number 5 for top flight. To start formalising this, we would need an identifier for the “pop songwriter” ability, and then to create identifiers for each defined level. Part of a pop songwriter competence framework could be the definitions, along with their identifiers, and then a representation of the level relationships. Each level relationship, as defined in the framework, would have the unlevelled ability identifier, the level identifier, the level number and the level label. If this is represented within a framework, the link to the containing framework is implicit, so might not show clearly. But the need for this should be clear if a level structure is represented separately. As well as defining levels for a particular area like songwriting, it is possible similarly (as many actual level frameworks do) to define a set of generic levels that can apply to a range of rankable, or even unordered, concepts. This seems to me to be a good way of understanding what frameworks like the EQF do. Because there is no specific unlevelled concept in such a framework, we have to make inclusion of the unlevelled concept within the information model optional. The other thing that is optional is the level label. Many levels have labels as well as numbers, but not all. The number, however, though it is frequently left out from some level frameworks, is essential if the logic of ordering is to be present. A key point that has been growing in conviction in me is that relationships for level attribution and level definition need to be treated separately. In this context, the word “attribution” suggests that a level is an attribute, either of a competence concept or of a person. It feels quite close to other sorts of categorisation. Representing the attribution of levels is pretty straightforward. Whether levels are educational, professional, or developmental, they can be attributed to competence concepts, to individual claims and to requirements. Such an attribution can be expressed using the identifier of the competence concept, a relationship meaning “… is attributed the level …”, and an identifier for the level. If we say that a certain well-defined and binarily assessable ability is at, say, EQF competence level 3, it is an aid to cross-referencing; an aid to locating that ability in comparison with other abilities that may be at the same or different levels. to a whole qualification, but care needs to be exercised, as many qualifications have components at mixed levels. An assessment can result in the assessor or awarding body attributing an ability level to an individual in a particular area. This means that, in their judgement, that individual’s ability in the area is well described by the level descriptors. Let’s look more closely at combining generic levels with general areas of skill or competence, in such a way that the combination is more assessable. A good example of this is associated with the Europass Language Passport (ELP) that I mentioned in post 4. The Council of Europe’s “Common European Framework of Reference for Languages” (CEFRL), embodied in the ELP, make little sense without the addition of specific languages in which proficiency is assessed. Thus, the CEFRL’s “common reference levels” are not binarily assessable, just as “able to speak French” is not. The reference levels are designed to be independent of any particular language. where “language” is replaced by the appropriate IETF language tag; “mode” is replaced by one of “listening”, “reading”, “spoken_interaction”, “spoken_production” or “writing” (or agreed equivalents, possibly in other languages); “level” is replaced by one of “basic_user”, “independent_user”, “proficient_user”, “A1″, “A2″, “B1″, “B2″, “C1″, “C2″; and “number” is replaced by, say, 10, 20, 30, 40 , 50 or 60 corresponding to A1 through to C2. (These numbers are not part of the CEFRL, but are needed for the formalisation proposed here.) A web service would be arranged where putting the URI into a browser (making an http request) would return a page with a description of the level and the language, plus other appropriate machine readable metadata, including links to components that are not binarily assessable in themselves. “Italian reading B1″ could be a short description, generated by formula, not separately, and a long description could also be generated automatically combining the descriptions of the language, reading, and the level criteria. In principle, a similar approach could be taken for any other level system. 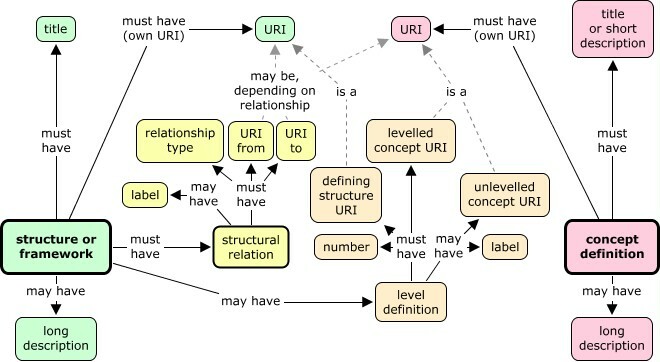 The defining authority would define URIs for all separate binarily assessable abilities, and publish a full structure expressing how each one relates to each other one. Short descriptions of the combinations could simply combine the titles or short descriptions from each component. No new information is needed to combine a generic level with a specific area. With a new URI to represent the combination, a request for information about that combination can return information already available elsewhere about the generic level and the specific area. If a new URI for the combination is not defined, it is not possible to represent the combination formally. What one can do instead is to note a claim or a requirement for the generic level, and give the particular area in the description. This seems like a reasonable fall-back position. Optionality was one of the less obvious features discussed previously, as it does not occur in NOSs. It’s informative to consider how optionality relates to levels. I’m not certain about this, but I think we would want to say that if a definition has optional parts, it is not likely to be binarily assessable, and that levelled concepts are normally binarily assessable. A definition with optional parts is more likely to be rankable than binary, and it could even fail to be rankably assessable, rather being merely unordered. So, on the whole, defining levels should surely reduce, and ideally eliminate, optionality: levelled concepts should ideally have no optionality, or at least less than the “parent” unlevelled concept. So in conclusion here are my proposals for representing levels, as level-defining relations. Use of levels Use levels as one way of relating binarily assessable concepts to rankable ones. The framework Define a set of related levels together in a coherent framework. Give this framework a URI identifier of its own. The framework may or may not include definitions of the related unlevelled and levelled concepts. The unlevelled concept In cases of levels of a concept more general than the set of levels you are defining, ensure the unlevelled concept has one URI. In a generic framework, this may not be present. The levels Represent each level as a competence concept in its own right, complete with short and long descriptions, and a URI as identifier. Level numbering Give each level a number, such that higher levels have higher numbers. Sometimes consecutive numbers from 0 or 1 will work, but if you think judgements of personal ability may lie in between the levels you define, you may want to choose numbers that make good sense to people who will use the levels. Level labels If you are trying to represent levels where labels already exist in common usage, record these labels as part of the structured definition of the appropriate level. Sometimes these labels may look numeric, but (as with UK degree classes) the numbers may be the wrong way round, so they really are labels, not level numbers. Labels are optional: if a separate label is not defined, the level number is used as the label. The level relationships These should be represented explicitly as part of the framework. This can either be separately, or within a hierarchical structure. Later, I’ll go back to the overall concept map to see how the ideas that I’ve been developing in recent months fit in to the whole, and change the picture somewhat. But first, some long-delayed extra thoughts on specificity, questions and answers related to competence. This entry was posted in ability, competences. Bookmark the permalink. Following more very helpful discussion with Geoff Carroll, I’ve changed what I was calling “evidentially assessable” and “evidential” to “unorderly assessable” and “unordered”. I hope this makes more sense. Thanks Simon, another good, thought-provoking post. My final related point is regarding O*Net. I don’t know whether you’re aware but the way that they measure occupational differences is by using questionnaires in the opposite way. In other words, they use specific “real life” activities equated to a specific level in order to help workers objectively rate their own jobs. Is this a style of level label/descriptor you had in mind for your model too? Neil, I really appreciate your questions and reflections! Your generic levels are the kind of thing that people seem to have a go at from time to time. If we are to have generic levels, it seems most important to have as wide agreement as possible. Now I’m not saying they’re perfect, but the EQF competence levels are at least enshrined as EU documents. You know the 8 levels there (see e.g. the PDF at http://ec.europa.eu/education/pub/pdf/general/eqf/leaflet_en.pdf ), though they refer to “work or study” and not just work. Examples of particular skills that belong to topic area levels seem to me to be very helpful, and to belong in a long or full human-oriented description. Maybe the O*Net style of things is similar, though of course the effectiveness of examples depends on people’s familiarity with them. Looking forward from the O*Net position, I could imagine many small tasks being rated on the O*Net scales — if this were done, any number of them could be presented to a user as examples of what is meant by that point on the scale. An intelligent tool would present examples most likely to be meaningful to that user. Thus, constructing a tool like this would need (a) generic level definitions, and (b) many level assignments. Looks like a good long-term strategy. As a compromise, could a new set of levels be developed but, as well as being written to be more intuitive, be designed to map more easily to existing frameworks (such as the EQF) as well? Would it were that easy. You know – we know better, we can do a better job… but as you know the problem will always be building consensus. On the other hand, if you have a big popular system (and it would be nice to think that you may well have soon) I guess you can impose a “consensus” by fiat, so to speak (as MS and other near monopolists tend to do). Better make it a good new set of generic levels, that I agree with! I think that we need to be very careful here that ‘level’ is defined as a different animal to ‘competence’. Otherwise we just have another bunch of competences. Hopefully my ‘bacon and eggs fry-up’ example might illustrate what I mean. I claim a competence ‘frying bacon and eggs’. My competence could be assessed ‘binarily': I can fry bacon and eggs and end up with an edible product (or burn the bacon, have the eggs only partially cooked and so on). Alternatively, this competence could be assessed ‘rankably': Level1 – I can cook the basic bacon and egg fry-up; Level2 I can cook the eggs so the yolk is runny and the white is firm, the bacon so it’s just nice and crispy; Level3 I can cook bacon and eggs in any desired way to meet the wishes of the consumer. Here I’ve tried to capture the *qualitative* nature of ‘level’. I’m doing the same activity, but if I’m assessed as at Level3, then I’m better at it. What I have resisted doing here is mentioning any ability to cook scrambled or poached eggs, or (heaven forbid) black pudding. If I did that, I might have a different competence, not just a change in level, because I have added new abilities. I might alternatively define a competence ‘cook a full English breakfast’. In respect of this competence, I might only have the capability to cook bacon and eggs, but I might know about the rest of a full English and even have a theoretical knowledge of how to cook black pudding. So for this competence, Level1 might be successfully achieved in parts, some actual cooking ability, some knowledge; Level2 might include black pudding, fried bread and mushrooms; Level3 might be assessed as the ability to cook all the ingredients of the full English, and higher levels might have greater and greater qualitative improvements. I think that this idea of ‘level’ is fundamentally different from a competence or ability, or at least it can be approached as fundamentally different. It is about how well or how badly you can do something, not simply an ability to do something. I notice that you’ve used the word ‘concept’ or alternatively ‘competence concept’ many times in the article, when I think you mean competence. I’m not sure this is helpful! What I’m getting at here is that I’m a bit unhappy with any confusion between the meanings of level and competence. I see ‘level’ as a bit like a facet in a thesaurus. It’s a different thing from a competence itself, and it might apply across groups of competencies. A level system is an hierarchical encoding scheme, classification system or ordered list of quality-based, assessable attributes that could be applied to one or more abilities or competencies. 1. I see ‘levels’ as the rankable assessable concepts, not a way of relating binaries to rankables. 2. I’m also not sure I like the use of the term ‘framework’ in relation to levels (although I recognise that it *is* used commonly). The problem is that ‘framework’ is also used for a collection of competencies, so there’s a potential muddle of terminology. 3. Skip that one, as I don’t really understand that! 4. This one I don’t like, because I don’t think a level should be represented as a competence. If a level is to be represented as a competence, then we can just relate the two (or more) competences and scrap the term ‘level’. 5 – 7 are really mechanisms for identifying and defining levels, so I have no problem with those. Finally it’s worth noting that levels may have multiple uses, not just in relation to competences, but also courses, qualifications, awards, prizes, and so on, as Simon has hinted. I don’t think that the use of vocabularies of levels should be any different in the competency domain from any other domain. Alan, thanks for the thought you have put into this. The topic of levels is a tricky one, and I have found it really does need a lot of thinking through. Hopefully when people like us have got it together, everyone else will have a model of levels that they can understand without too much confusion! Let’s get some of the easier stuff out of the way to start with. The difference between a “competence” and a “competence concept” is that a competence *is* something that a person has, a personal quality; while the concept is the *idea* that you or I might have to formulate the definition of what it is that people have. Having said that, I have probably sometimes glossed over the difference. Your “bacon and eggs” example works fine, as far as I can see. Frying bacon and eggs is a rankable concept, as that imprecise way of formulating it means that it is open to people doing it better or less well. And I think your levels are reasonable, too. The point about levels is that each individual level definition is a competence concept in its own right. For example, your level 2: “Can cook the eggs so the yolk is runny and the white is firm, the bacon so it’s just nice and crispy” is a nicely defined binary concept. Taken out of context, that is a serviceable definition of a competence, that could conceivably appear in a cookery occupational standard. It is a level just in the context of the rankable concept of “fry bacon and eggs”. Perhaps we are in violent agreement I’m not saying that a level is a way of doing things – put that way it wouldn’t make any sense to me – but that relating rankable concepts to related binary concepts is done by defining levels. Defining levels is a way of carving out binary concepts from a rankable concept. All the common examples of level that I can currently think of do just that: their context is a rankable concept, and each level is a binary concept. I wonder if you meant “ranked” rather than “rankable” in your reply to proposal 1? Each level definition is a binary, *ranked* (no longer rankable) concept. In the end, different people “like” to define things in different ways, to fit in with their own way of seeing related things. I suggest that we should be working towards definitions that are tolerable for everyone, rather than ones that are liked by favoured people and not by others. Of course, where people “like” definitions that work effectively for the greatest number of people, then let’s go with what those people like! Thus, my followup to proposal 2 is to say that, as far as I can see at present, “framework” is a word that is very often used in connection with a scheme defining levels. EQF, NQF, QCF, SCQF, etc. etc. That’s the main reason I use the term. I would be equally happy with the term “level scheme”. So I’m glad you appreciate most of my proposals, and I think the other ones will not be difficult to iron out – or hammer out? – agreement about. April 2012: I have changed the terminology slightly here. The verb “attribute” replaces the verb “assign”.